There are many ballistic programs out on the market, I have used several including Lee Shooter , Point Blank which is a free program for download, I have tried several of the more expensive ones and trials like the ballistics program from Barnes Ballistic Software .Some are quite expensive while others are free. 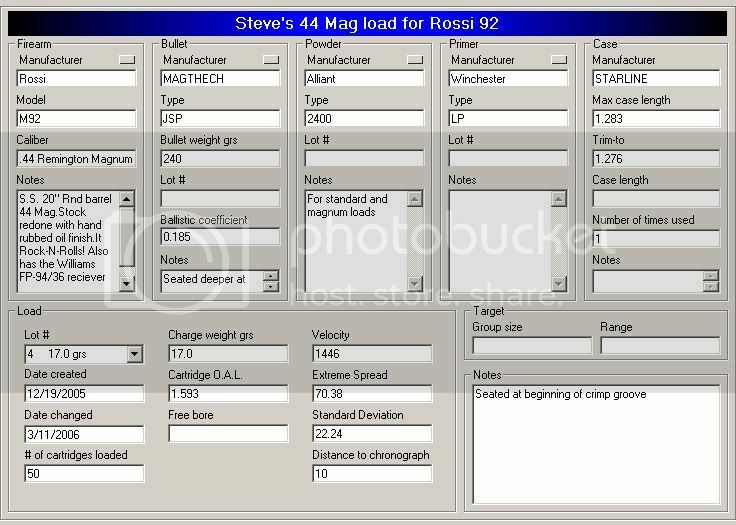 I have been using a program for over a year now named Robs Reloading Organizer. Out of the programs ive tried this one I like the best. RRO is a combination reloading data storage and ballistics program. While there are other programs out there that cost 50.00 - 100.00 and up that doesn't have the features that RRO has. I will touch on just a few of these but the robsoft website will go into much greater detail and screenshots. Some of the features I like about this particular program are it has a simple user interface, has the ability to help you when creating a series of loads for testing new powders and bullets. 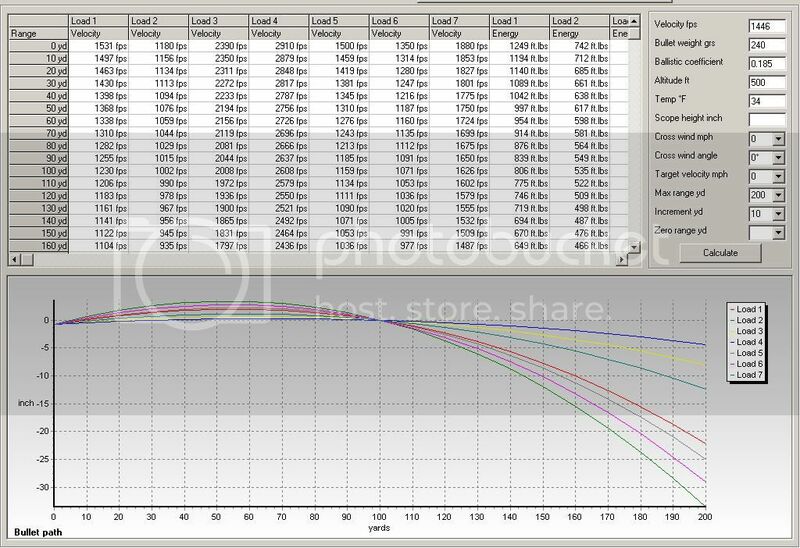 RRO can even help you when testing loads for best free bore (jump to the lands) measurements. The ballistic section of this program is able to calculate the velocity, energy, trajectory, total drop, time of flight, wind deflection, lead, MOA, and the sight adjustment up to 1000 yd. It is possible to compare up to seven different loads at the same time and save the data as CSV or an image file. The program uses the Ingalls tables for the ballistic calculations. This is identical to the G1 table which most of the bullet manufacturers use to calculate their bullets BC. One feature I like in particular is RRO is able to communicate with my Beta Master Shooting Chrony . You can download your saved velocity information directly to the program just by connecting a cable from the chronograph to the computer. The program can handle up to 20 shot strings of any length, the program also calculates the average velocity, standard deviation, extremespread and shows the highest and lowest velocity. You can add and delete shots and the program can display a chart with all the velocities in each shot string. If you don't have one of the supported chronographs, you can use the data receiver screen to enter shot velocity information by hand. RRO has databases for your Firearms, Bullets, Powders, Primers, Ammunition, Max & trim to length. You can create loads by Percent, Max and min, weight, and freebore. RRO features calculators for Flight time lead, energy, recoil energy, sectional density, bullet stability, and case capacity. The program also features a conversion tool for length, weight, velocity, and energy. Anyone may use this software during a test period of 30 days. Following this test period of 30 days, if you wish to continue to use Rob's Reloading Organizer, you MUST register to use all the functions in this software. You can still use the program to save and open your reloading data when the test period is over, but most of the functions will be locked until you have registered the program. For 35.00 bucks this program cant be beat! Heres the link to Robs Reloading Organizer website and free 30 day trial. I have tried several other brands, and out of those my pick is Robs Reloading Organizer. Here is a couple more links for reloading software.